I can’t believe it is December 1st The past 6 months have been a big blur. My (Shannon’s) family moved. For some of you that may not be a big deal but it was for me. My husband is the world’s most talented man (in my eyes). The home we bought 11 years ago was an old farmhouse that we re-built, actually Anthony AKA my husband re-built. We got married, had four beautiful babies in that house and I met God at that house!! We are now renting that home to a beautiful family that seems to love it as much as we do. Our new home Anthony also re-built to help it accommodate our family. This is the house I grew up in and we needed to make it our own. Unfortunately this meant not having a husband for a long time because he would work his regular job and work on our new home at night. Reminder we have 4 kids and we were moving (which was my responsibility). Long story short we did it, but I could never have done it without the help and hard work of my parents. They are the hardest workers I know and if I can do half of what they do to help my kids some day it will be a blessing! The other big transition was going from home school to public school and so far it is going good but stressful. That is another story that I will save for later. All of these transitions have put my food and fitness on the back burner. I’m thankful that I have set up some good habits and rules for myself in the food department that have kept me somewhat on track but it is still hard, not gonna lie! I thought about another accountability while reading my bible this morning and it really summed up how I feel in my daily walk with God and in this world. It’s Ezekiel 19:10-14 I want to type it all out but I would probably lose you but here is the jest of it is. We are like a vine planted by the water (which is a symbol of being close to God for me); it is fruitful and full of branches because of the water but when we are apart from God those strong fruitful branches whither and it is in the desert, dry and thirsty. This is how I know when I’m not keeping God first in my life. When stress, fear, anger, and worry enter my life I know that I’m not focusing on the One who already has it all figured out. Acts 17:24-31 gives a great perspective. Love this Shannon and I too feel the same way! 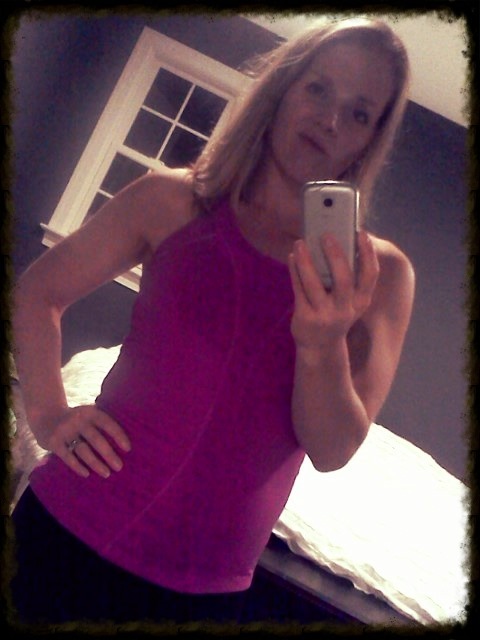 I wore that tank yesterday to do the Burpee Challenge in TN and felt a little like a stuffed animal! Miss you and love you! You are an inspiration to all and remind me daily that GOD first and foremost is our number 1 priority! Love you! !